Need advice about a specific Lexus RX problem? Chart based on 30 repairs. See TSBs and recalls for the 2015 Lexus RX. Chart based on 23 repair trips. The repair cost chart excludes repairs made under warranty, do-it-yourself repairs, and repair trips that include maintenance. 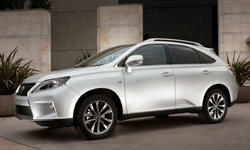 See repairs for all Lexus RX model years. 55700 mi Water pump bearing was failing causing loud noise from engine compartment. Water pump was replaced under warranty. 13000 mi Multiple pieces of lower door trim had to be removed and reattached due to defective clips. 24000 mi Catalytic converter vent problem, causing a rattle/buzz on cold start. 10000 mi Seam in rear leather seat pulled apart. Dealer refused to cover 100% of repair. I will take to another shop to repair at lower cost. US $25 Seam in rear leather seat pulled apart. Had it repaired by an independent shop. Paid $25. Dealer wanted $800. 18000 mi Noise whenever steering wheel was turned. It continued for two days until I took it to dealer. Noise didn't reproduce for dealer, although they kept car for 48 hours to check. No repair done. US $140 Center console cup holder lid jammed open. Had to disassemble console to free lid. 36456 mi Transmission (delayed engagement issue) Park to Drive takes 3 seconds Dealership had to replace the whole transmission and warranty covered the full cost with free loaner. 29000 mi Noise from rear seat when hitting bumps. Buzzing. Has existed since purchasing vehicle used 12/2016. Returned 3 times for repair. First time: nothing done. Second time: about 1/2 problem fixed. Third time: seat removed and sent to auto upholster shop. Improvement but still not fixed totally. 30000 mi 4th trip to repair the buzzing in the rear seat when driving over uneven road surface. Every time they have repaired it the buzz/rattle changes. And every time it diminishes somewhat in loudness, plus the road bumps that caused previous noise, now don't, but different bumps do! 34000 mi Tire valve stem popped up suddenly making it impossible to inflate tire. 36000 mi Center console cover stopped sliding. Center console replaced by dealer. Warranty covered 1200. Wouldn't have bothered if out of warranty, more of an annoyance than a problem. 34000 mi Fan speed does not increase to maximum when inside temp is hot when set to "Auto". Dealer claims this is normal!!!!!!! 35000 mi Adjust rear seats and condition leather to address squeaking. 27000 mi Replaced right front strut and upper mount. 25000 mi Banging noise when going over rough surfaces. Lexus regional service specialist was on site to check the vehicle. 25000 mi Banging noise when right front wheel goes over rough surface . Particularly noticeable at low speeds. 26000 mi Replaced right rear shock. Didn't fix the noise. I don't understand why Lexus specialist decided to replace it because it was clearly happening when front right was going over bump. Jan 2018 Front right strut and strut mount were replaced few weeks later and that fixed the problem. 8780 mi It was a scheduled maintenance visit and I had them pull up the parking brake, all very minor. See our lemon odds and nada odds page to see vehicles with no repairs or vehicles with more than three repairs. To see how frequently 2015 Lexus RX problems occur, check out our car reliability stats.